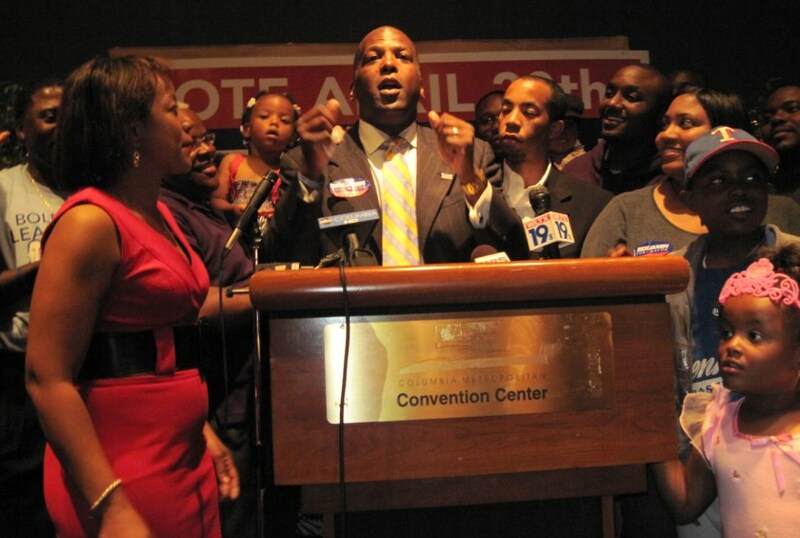 Remember the night Steve Benjamin was elected mayor back in 2010? It was a heady evening, and a lot of people, including people you might not expect, were excited about it. There were the usual suspects, of course. A lot of black voters were thrilled to have had the chance to elect the first black mayor of a major South Carolina city, only 15 months after seeing Barack Obama become president. And even though this was a nonpartisan election (as all elections should be), it was quite natural that white Democrats would be happy, too. Steve had been their party’s nominee for attorney general several years earlier, and had also served as an agency head in Gov. Jim Hodges’ administration. And I meant it. It was a big moment. I mean, the man had tears coursing down his face as I sent that out. And if you didn’t get a contact high from being in that crowd, you’ve got ice water in your veins…. So that political Odd Couple, in the spirit of the moment, gladly posed for me, and then went back to the celebration. Why were so many different kinds of people happy about this result? Well, Rick’s motive was pretty clear — his Dad’s political consulting business had worked to get Benjamin elected. But the next question is, Why would the Quinn’s — as solidly identified with Republican candidates as anyone in South Carolina — work for this Democrat, even in a nonpartisan election? His campaign had been about pulling together a fragmented community — not just split by party and race and class, or by town and gown or government and private sector, but by the fact that government itself here is the most fragmented I’d ever seen in my career when I arrived at The State to become governmental affairs editor in 1987. I came here from Wichita, Kansas — a city of about the same size at the confluence of two rivers, with a deep cultural split between the east and west sides of the water. Sound familiar? But it was easy for Wichita to move forward together because it was one city in one county with one school board and so on. 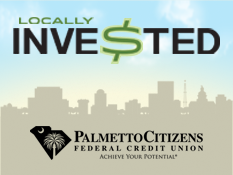 The economic community of Columbia is split not only between two politically incompatible counties, but into about 10 municipalities, seven school districts, and a confusing array of little special purpose districts that provide services cities and counties should provide (Richland County Recreation Commission, anyone?). Benjamin had spoken of all of that as ONE Columbia, with optimism about what we could do together, with eloquence and Kennedyesque vigor (vigah? ), and people were pumped about it. Speaking of all that garbage — that’s what causes me to bring up the subject of that night eight years ago. 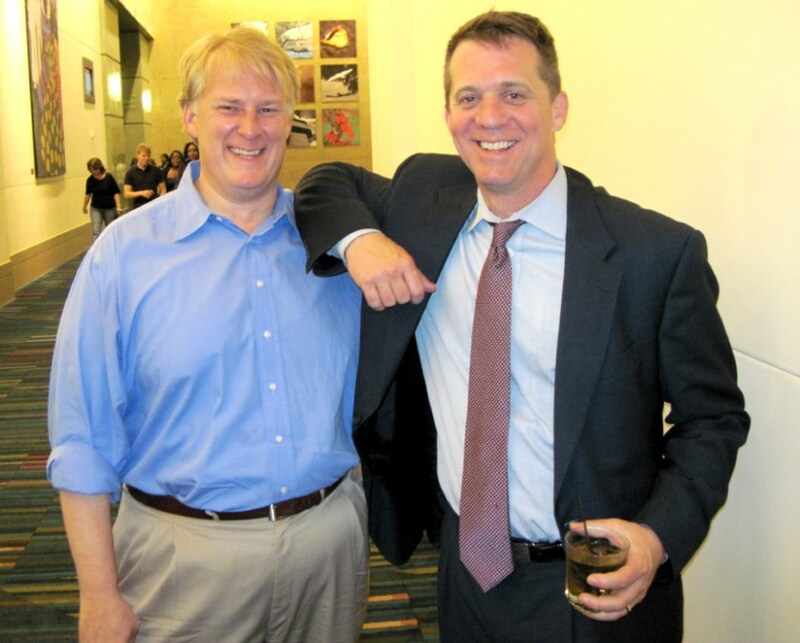 I hear that someone is about to use MY photograph of James with Rick Quinn — without my permission, of course — to attack, to smear, to malign James Smith, to damage his chances of becoming governor, or even of getting his party’s nomination in the June 12 primary. If this attack emerges, and it’s anything like what I’m hearing (I hope the rumors are wrong) it will be an expression of the things that make our politics ugly, relying on such things as blind partisanship, mistaken impression, damning a person for incidental association rather than for anything he ever did…. Will Folks predicted something like this would happen several months ago, having gotten wind of a group that was prepared to spend a lot to try to take down James Smith’s candidacy, by trying to make him appear to be something he’s not. I don’t know if what I’m hearing about now is the same thing. We’ll have to see when it emerges. The thing is, James Smith is that rare thing in politics — a guy who not only looks like a Boy Scout, but really is one. He’s always been a clean, honest, diligent public servant. To try to suggest he is something else would be disgusting. And it would be especially appalling if a photo of mine was misleadingly used to do that. Steve Benjamin on that heady night in 2010 when he was elected mayor. This entry was posted in 2018 Governor, Character, Democrats, James Smith, South Carolina, Steve Benjamin on May 21, 2018 by Brad Warthen. I’ll concede that working toward certain common, shared goals for the common good, and, doing so in a spirit of compromise is a worthy objective of political discourse. In a perfect world the two major parties would each lay out their preferred method for achieving a specified objective and then proceed to debate the merits of those methods and then ultimately vote on a bill or bills that hopefully achieve the objective. The voters would choose between the two (or more likely several) competing visions and at times one side or the other would get very little of their chosen method. At times a compromise would be reached that completely satisfies no one. At the end of the day the final solution would be accepted and everyone would embrace it and try to make it work. In a perfect world that is how politics should work. But alas that is never going to happen. Once upon a time government did work more or less that way. I think everyone on this blog pretty much agrees we are far too polarized for that approach to see the light of day any time soon. What we have now is a winner take all government. The out party is completely shut out of any relevant role in the process. Ok, so we probably all agree, more or less, that this is where we are. Now comes the part where we will not agree. My reading of Brad and the false equivalency crowd is that the ideal model can still work within the existing ideological construct if only BOTH sides would throw away their partisan blinders and come together in a spirit of cooperation. I maintain that in many respects the Democrats HAVE tried to use the ideal political model only to get savagely rebuffed at every turn. (I have offered up many examples of that obstructionist behavior but will refrain here.) The Democrats are left with two unattractive options. Either they can continue to offer solutions that are in keeping with the party’s world view and hope to work with the Republicans. Or they can recognize the reality that the GOP has been taken over by the ultra right wing ideologues of Trump and his minions and just not even pretend any longer that cooperation is an option. As distasteful as that is it the only real option. For now the only thing to do is call out the false equivalency warrior for the enablers that they are and work toward winning elections. Hopefully at some point in time more sensible heads will prevail among conservative thinking folks and the GOP can become a reasonable organization once more. But until that time liberals must consider this a no holds barred fight to the finish. It is distasteful to think this way and the opposition is far more ruthless and skilled at this but fight we must. It is the only way forward at this time. And while she hasn’t commented here recently, some of you will recall that Kathryn isn’t normally the sort to get all teary. So the obvious question is (aside from the Smith-Quinn photo issue), was the headiness of that evening justified in retrospect by what has happened in the city in the intervening 8 years, in your opinion? Well, that’s a whole other subject. I’d have to think hard about that one to give a definitive answer. After doing a heap of research to remind me of issues that have come and gone over the years. Maybe y’all can help me remember. And some of the biggest things I’d need to look at are things I’ve never fully made up my mind about (but about which others have PASSIONATE opinions) — like the Bull Street development. Until RR tracks are removed from street leve city of Columbia government gets a failing grade from me. Yeah, but Benjamin makes up for it by having rap concerts and skating rinks up… both of which are money losers. Yeah, I remember Bob “Rubber Stamp” Coble. That guy would approve everything that crossed his desk. One of the many reasons I moved across the river.